Can you believe it's already the 10th?!? I can't! My head is about to explode! Another year is just around the corner! And I'm SO busy from this point forward. But I do LOVE this time of year! I think that Brady is going to be Tigger this year. He loves all things Disney. It's so cute how he's becoming his own little person. Stay tuned for pictures. 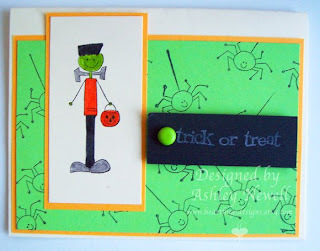 Fun card - love those little spiders!! I miss my kids dressing up in cute costumes... now that they're older they don't go for the cute stuff any more! Enjoy it while it lasts!!! You've just inspired me to sit down and make some Halloween goodness! Very cute card!